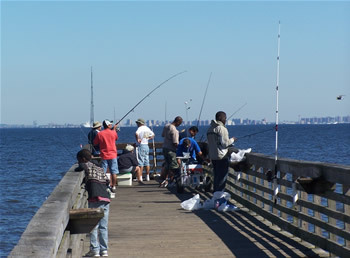 A NJ State fishing license is required for all freshwater fishing (ages 16 through 69) in the Monmouth County Park System and a trout stamp is also required when fishing for trout. A license is not needed for saltwater fishing (coastal river/ocean/bay), but catches must conform to NJ State species size and number limits. A NJ State fishing license can be purchased at any local fishing supply/bait shop. For more information about fishing licenses, visit the NJ Division of Fish & Wildlife website. Fishing licenses are NOT available for purchase at the Manasquan Reservoir. Historic Walnford, Upper Freehold Creek Cast from shore Yes Carp, catfish, pickerel, large mouth bass, sunnies & freshwater eels. Shark River Park, Neptune Pond & River Cast from shore Yes Pond has bluegills & sunnies. River has trout.